Chamba: Chief Minister Virbhadra Singh announced to construct a bus stand near Sheetla Temple Bridge at Chamba town. He said that the old Jail which had been shifted to Rajpura, will be demolished for it. 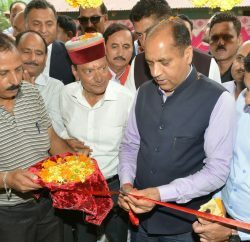 The construction of new bus stand was a long pending demand of people of the town which would help in decongesting the Chamba town and smooth flow of traffic would be ensured. While addressing public meeting at Chamba chowgan, Chief Minister also announced to upgrade seven high schools to government senior secondary schools which include Shilla Gharat, Gagla, Saach, Mangla, Kumharka, Dhulura and Kolka. He also announced to upgrade Kurena and Banjal middle schools to government high schools and Kurtha-Dhar, Fatehpur, Gadrad, Bunjal-Deewankhana, Daroga and Tipra primary schools to government middle schools. He announced new primary school for Kali village in Pilyur gram panchayat. He said that PG Degree College, Sultanpur (Chamba) will be completed soon to facilitate the students of the area. 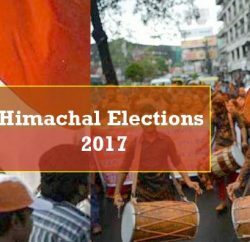 Virbhadra Singh said that Chamba was one of the oldest town of the State which had distinct culture and customs. The millennium celebrations of the town were organized by the Congress Government in 2005. He said that Congress Governments had always given priority for the development of Chamba district and various colleges had been opened in the district by the Congress Government. He said that Government would fill up the vacant posts of doctors in the district to provide better health care to the people of this district. 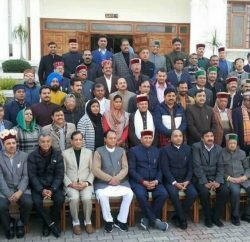 Forest Minister Thakur Singh Bharmouri, Asha Kumari, MLA, Chander Kumar, former MP, Kuldeep Singh Pathania, Chairman, State Pollution Control Board, Kewal Singh Pathania, Vice Chairman, State Forest Development Corporation, and other prominent person of the area were present on the occasion.